Calling all berry lovers!!! 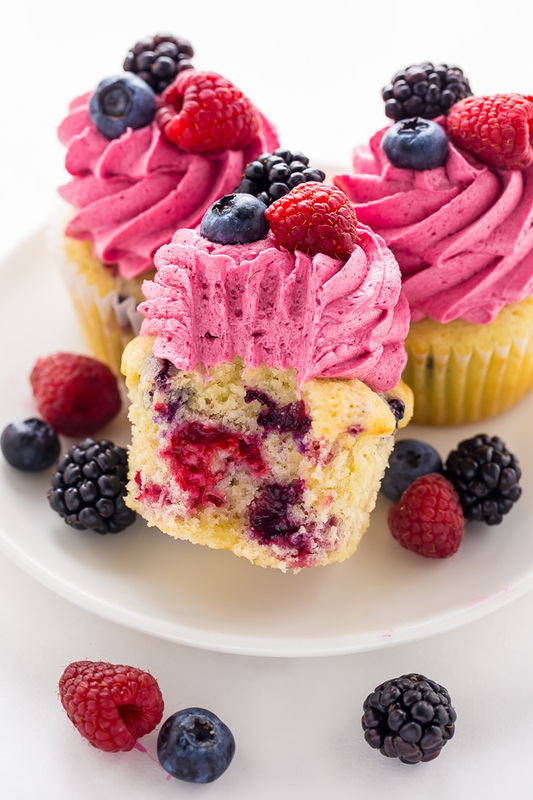 These Triple Berry Cupcakes are moist, fluffy, and bursting with fresh fruit in every bite. 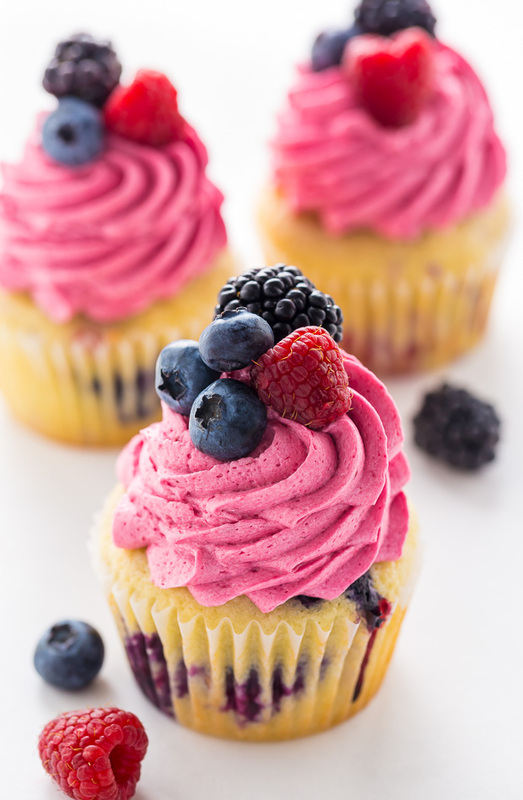 These Mixed Berry Cupcakes are a great Summer recipe! First things first: Happy Friday! And to those of you who celebrate: Happy Easter Weekend! Any special plans for you? We’re packing up the car this afternoon and heading to Philly for some quality family time. It’s going to be 85 degrees and sunny (!!! ), so I’m looking forward to soaking up some sun, playing with the twins, and eating my weight in carrot cake. Can it be Easter weekend every weekend?!? Pleeeeease. Before I go, I wanted to pop in and share these stunning cupcakes with you. 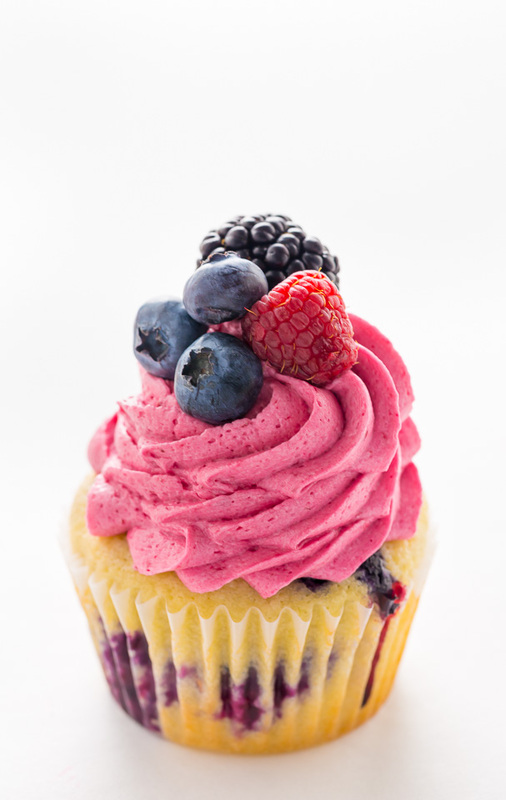 Triple berry cupcakes!!! AKA the cupcake recipe you’ll be making all Summer long. They’re super moist, spiked with a hearty splash of vanilla, and loaded with a medley of fresh berries! In addition to all of that, they’re topped with colorful swirls of berry buttercream! Because we want the moistest cupcakes possible, this recipe calls for cake flour. Cake flour is extra finely ground and gives the cupcakes their silky soft texture. In most grocery stores, you’ll probably find cake flour in the baking aisle. You can also buy it online here. You must toss the berries in flour before adding them to the batter. This dusting of flour helps keep the berries afloat during the baking process, and ensure you won’t slice into a cake full of sunken berries. Feel free to use fresh or frozen berries for this recipe. If you use frozen, don’t thaw them first. 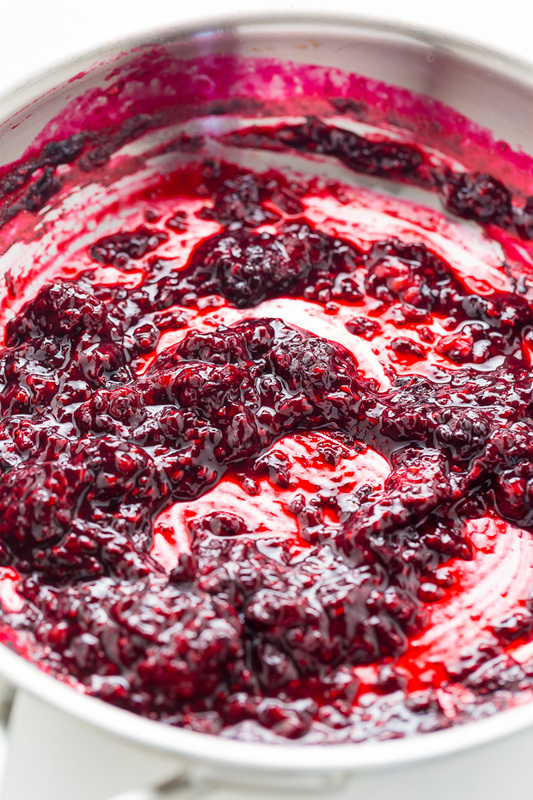 To make the the colorful berry frosting you’ll need to first make a berry puree. You’ll begin with one cup of berries (a 1/3 cup of each variety) and cook them down until the mixture has reduced to about a 1/2 cup. A fine-mesh strainer is required for this recipe! You’ll place the strainer over a small bowl and push the berry puree though. You’re only going to use the liquid in the bowl. You should have between a 1/4 cup and 1/3 cup of liquid in your bowl. Discard any skins/seeds left in the strainer. Make sure your berry puree is completely cool before adding it to the buttercream. If the puree is even a little warm it will throw off the consistency, leaving you with a grainy mess. The puree typically takes 30 minutes to cool (in the fridge), and can be made ahead of time. To reach the proper buttercream consistency, you’ll want to make sure your butter is very soft before beginning. I suggest setting your two sticks of butter out on the counter for at least an hour before unwrapping them and getting busy. You’ll know your butter is soft enough when you can press your finger into the top and an indentation is effortlessly made. Cold butter as well as melted butter should never be used when making this buttercream; it will not work. Once all of the confectioners’ sugar has been added to the frosting, be sure to beat it on medium-high for the FULL 2 minutes. Beating the frosting on high makes it SUPER luscious and fluffy. You will need to use a stand mixer or handheld electric mixer for this step. If the frosting appears too thin, simply add a little more confectioners’ sugar, one tablespoon at a time until desired consistency is reached; if your frosting appears too thick, add a touch of milk. I pipped the frosting on using this closed star tip. 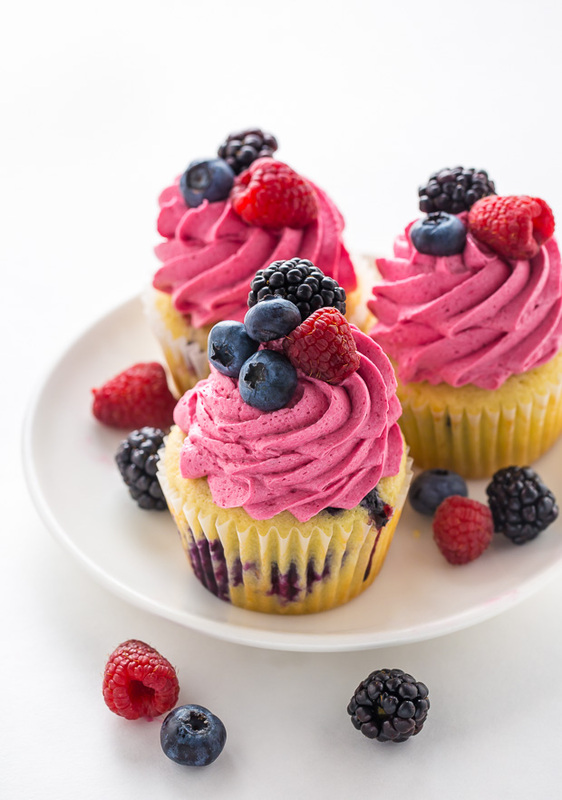 While I love decorating these cupcakes with fresh berries, it’s not required. However if you are going to decorate them, I suggest using the tiniest berries you can find. They look cuter and don’t weigh down the frosting as much. Farmers markets typically have better options for this than grocery stores. 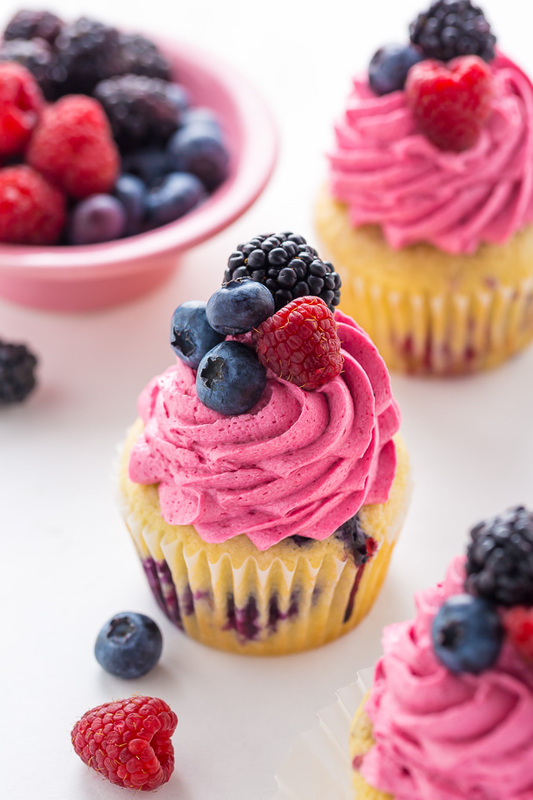 These VERY Berry Cupcakes are moist, fluffy, and bursting with flavor! Perfect for Summer parties and picnics! Preheat oven to 350 degrees (F). Line 2 cupcake tins with paper liners; set aside. In the bowl of a stand mixer fitted with the paddle attachment, or in a large bowl using a handheld electric mixer, beat the butter, vanilla, and sugar on medium speed until light and fluffy, about 2 minutes. Add in the eggs, one at a time, beating well after each addition. On low speed, beat in the sour cream, then the milk. Turn mixer off. Add in 3 and 1/4 cups of the cake flour, baking powder, baking soda, and salt. Use a fork to lightly toss the dry ingredients together. Using a rubber spatula, gently fold the dry ingredients into the batter, mixing just until combined. Be sure not to over mix here or you cupcakes will be dense! In a separate bowl combine the berries and the remaining flour; toss to coat, being sure all of the berries have been dusted in the flour. Add the berries to the batter and, using a rubber spatula, gently fold them into the batter, stirring just until combined. Spoon batter into prepared cupcake tin (filling 1/2 way each - not more or they'll overflow) and bake for 18 minutes, or until a toothpick inserted in the center comes out clean. Cool cupcakes 10 minutes in the pan, then carefully transfer them to a cooling rack to cool completely. 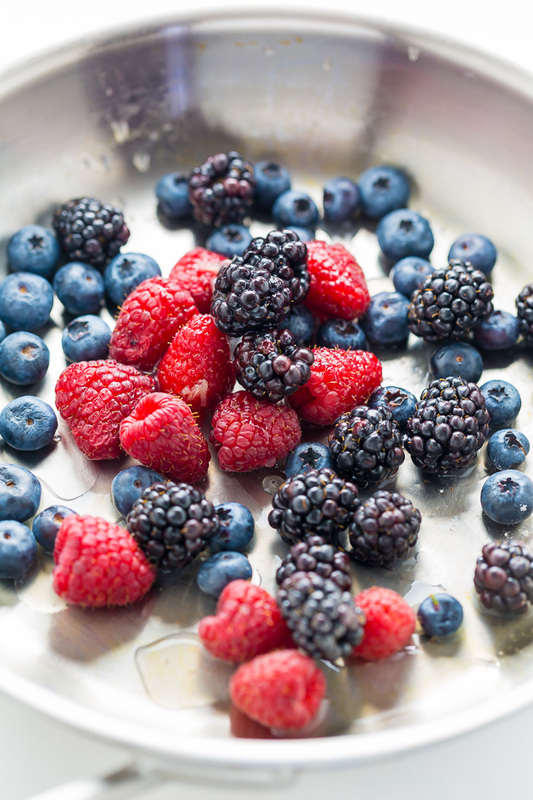 Combine the berries and lime juice in a small saucepan; bring to a simmer over medium heat. Once simmering, stir the mixture occasionally, breaking up the berries with a wooden spoon, until they've become soft enough to mash effortlessly. It should look like thick berry jam. Once the mixture can coat a spoon (you should have 1/4 cup of berry puree) remove from heat. Allow mixture to cool completely before using. <--- That part is SUPER important! You can place the puree in the fridge to speed this process up. In the bowl of a stand mixer fitted with the paddle attachment, or in a large bowl using a handheld mixer, beat the butter on medium-speed (scraping down the sides as needed) until completely smooth; about 2 minutes. Add in the confectioners sugar, one cup at a time, on low speed. Once all of the sugar has been added, add in the berry puree and beat until completely combined; about 1 minute. Add in the salt. Once all of the ingredients have been added, increase the mixer speed to medium-high and beat frosting for a full 2 minutes - this thickens up the frosting and makes it nice and fluffy. If the frosting appears too thin, you may add a little more confectioners' sugar; if the frosting appears too thick, you may add a teaspoon or two of milk. Frost cooled cupcakes as desired and top with fresh berries, if using. Triple berry puree may be made up to three days ahead and stored in the fridge, covered, until needed. Triple berry puree must be completely cooled before use. Cupcakes are best eaten the day they are made but will keep, covered and stored in the fridge, for 3 days. Bring back to room temperature before serving. You will have enough batter to make 16 cupcakes. These look right out of a bakery! So pretty. I love the color of these cupcakes! These look amazing! Do you think this recipe would work baked in a 9 x 9 pan instead? All my favorite flavors in one little package. There’s nothing better than a beautiful cupcake! Thank you! I try to bake ones. Soon it’ll be a lot of berries and it’ll be tasty. Does this recipe make 12 or 24 cupcakes? What about these being made into a cake? Have you tried making these with fresh berries and freezing them before frosting? If I don’t have full fat sour cream will it taste bad?